Ideal for small to medium sized rooms, such as bedrooms, offices or kitchens. The widest sound of any smart speaker Wall-to-wall stereo sound with Alexa voice control built in. Listen to your favourite audio tracks wirelessly, via Bluetooth and Wi-Fi audio streaming. Ideal for medium to large rooms such as dining rooms, larger bedrooms and offices or smaller living rooms. BOSE® Soundtouch 30 III White SoundTouch™ 30 Wi-Fi® Series III Wireless music system with Bluetooth® connectivity in White. 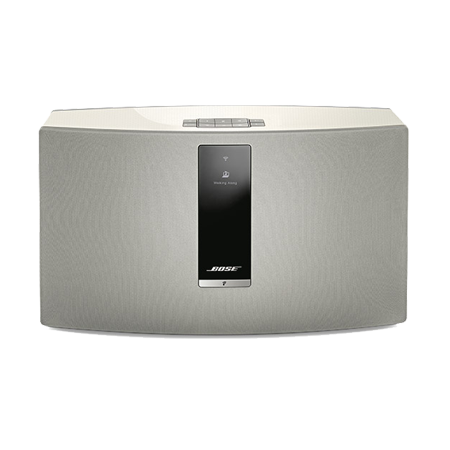 The most powerful wireless music system from Bose. Set up and connect within a few minutes.